Goals are one of our 5 priorities. So what is a goal? A goal is a target. It is something we desire to accomplish. As we work and study and live our lives, a goal provides a filter through which we can choose our actions. For example, if my goal is to achieve my 2nd degree black belt by May, when I reach a choice, it will help me make a productive choice. Should I watch television or should I study my techniques first? If I want to reach my goal by the set time, it would be more productive to study before I watch tv. 1. One PERSONAL goal. What is something specific you want to accomplish or achieve in your personal growth this year? 2. One KARATE goal. 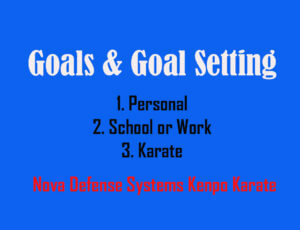 What is a specific goal and end date you want to accomplish in karate this year? 3. One SCHOOL/WORK goal. What is something specific you want to achieve in your school or work this school year? You don’t necessarily have to share these with everyone, but the instructors would love to see what you come up with so we can support you in achieving your goals. See you tonight! Ready to grow? Here’s our class schedule. See you soon!